Pigskin and Pine Tar – The botttom of the ninth and the fourth quarter. Drew Brees or Johnny Manziel? If quarterback decisions were made solely on statistics, Baker Mayfield would be the unquestioned first overall pick. If they were based on measurables, he wouldn’t crack the third round. The opposition of the two most important metrics regarding QB evaluation has turned Mayfield into one of the most interesting prospects of the last decade. Personally, I wasn’t sold on Mayfield at midseason. Sure, he put up video-game numbers, but he was shredding Big 12 defenses that couldn’t punch their way out of a paper bag. Lighting up Kansas or a downtrodden Baylor program is no indication of NFL success. While the height question was holding everyone back, the quality of opposition was just as pressing of a concern for NFL teams. Mayfield’s accuracy and velocity are both top notch. His performance against NFL quality defenders in the CFB Playoff semi-final against Georgia was immaculate. 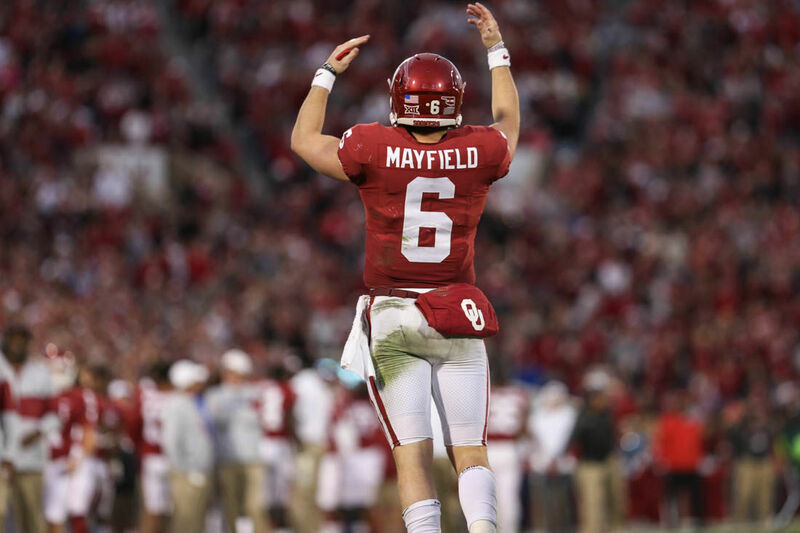 Time after time Mayfield stepped up and made clutch throws to keep Oklahoma in a game where their defense was demonstrably outmatched. The tape from that game was enough to solidify Mayfield’s status as a first round pick. Unfortunately, there are few teams that need a QB outside of the top 5. If he slips past the Broncos at number 5, it could be a long wait before he hears his name called. Mayfield’s composure in the pocket and accuracy, coupled with the gaudy statistics he produced in Norman place him above Josh Allen for me, but below Darnold and Rosen, who both possess all of Mayfield’s arm talent but add to that the height desired by NFL scouts. The trash-talk, swagger, and general arrogance will rub some fans the wrong way, but it may be genetics that unsettle NFL teams. His height will remain at question until he proves the doubters wrong. He could be well on his way to making a lot of people look very foolish. There are box scores to check, and all is right in the world. Lefty looks good so far at 35, the deuce is really snapping. Think we can squeeze another year out of him? I tell ya what, I had that kid pegged for Double-A, but he’s going to force some tough decisions around here. You ever hear of this guy Jensen? Been riding the bus for years in the minors, but it sure didn’t look like it when he smacked that one halfway to Phoenix. I’m convinced this rookie is going to be a 10x All-Star and the savior of our franchise based off of 5 Cactus League games. He’s hitting .450 in Spring Training. He’s clearly winning the MVP. He’s hitting .130 in Spring Training. It’s only Spring Training, completely irrelevant. ______________ followed a new offseason program and is in the best shape of his life. This is the year! He struck out that one guy who used to be a perennial All-Star but is 40 now and fighting for a roster spot, so he’s the next Pedro Martinez, and nothing you tell me can convince me otherwise. You know, if this guy who used to be a top prospect but never figured it out, another guy that had one good season 5 years ago, some other player that is always injured, and washed up veteran put it together, we could have a real shot at the second wild card! I’m sure the pulled hamstring on day two is nothing to worry about long term. He got pegged in the hand and broke his pinkie? He’s a walking disabled list. Trade him now! Take caution to avoid falling into the trap of thinking in the “Spring Training-isms” above. But take heart none the less in the return of America’s pastime. Instead of cavernous bleacher sections filled with rabid fans roaring at the top of their lungs, there are grassy hills filled with oblivious kids running around aimlessly, having the time of their lives. Instead of the bright lights and cloudy breath of October baseball, there are clear skies and dazzling sunlight. Instead of 9 inning CGSO’s by Bumgarner and Kershaw, you have your buddy’s cousin’s roommate getting knocked around for six hits and three runs (two earned) in 1.2 innings. But the mitt pops just the same, and the back cracks just as it does in the middle of the pennant race, and after a long hibernation, we will take whatever we can get. Hope springs eternal, even for the A’s and the White Sox and the Phillies and the Blue Jays and every other team that is expected to go gently into that good night. Dreams will come true, and dreams will be crushed. Someone’s time will come and someone’s time will end. Such is life, and such is baseball. P.S. The origins of how the Grapefruit League (the spring training league in Florida) came to be named is always worth a read. Is USC pedigree an asset or liability at this point? 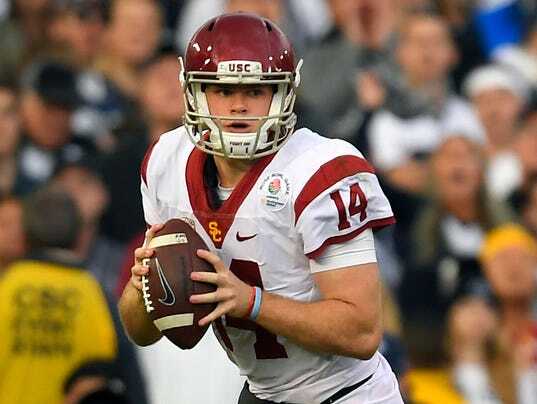 Sam Darnold’s electric performance in the 2017 Rose Bowl clearly established him as a frontrunner for the 2017 Heisman Trophy and potential 2018 first overall pick. Unlike his southern California counterpart, both in origin and university, Josh Rosen, Darnold is understated and mellow. In contrast to Rosen, who flaunts the California QB cockiness that Aaron Rodgers embraced before him, Darnold is reserved and careful to say the right thing-a major difference from Rosen’s tacit implication that he would rather not go to Cleveland. Off the field, Darnold presents a very different persona than that of Rosen, who he forever he compared with-but does that really matter? Scouts love Darnold’s burly frame and big game moxie, giving him that “gamer” feel that old time NFL scouts love. Darnold is a linebacker at heart, not playing quarterback until his sophomore year in high school due to an injury ahead of him on the depth chart. While intangibles are great, it’s important to keep sight of what should be evaluated when considering quarterbacks-how well they can actually throw the football. After lighting the world on fire and staking his claim as the best QB in the country after coming back to beat Penn State in the absolutely thrilling 2017 Rose Bowl, expectations were sky high headed into the 2017 season. Darnold mostly fulfilled them, but Rosen’s excellence and Josh Allen’s raw arm strength combined with a worrying turnover habit developed by Darnold ignited nationwide debates over who deserves to be the number 1 overall pick. When I see Darnold play, I see a player that has the potential to be a franchise guy, but isn’t quite there yet. The mechanics are a little loose, perhaps too much so for NFL defenses that allow for a razor thin margin of error. His ceiling is Andrew Luck, but he is a ways away from that right now. Watching Darnold play against an Ohio State defense chock-full of NFL talent in this years bowl game was worrisome. He missed open receivers and looked skittish in the pocket. The guy I couldn’t help seeing was Eli Manning on a bad day. Now, Eli on a good day is a Hall of Famer. But young, inexperienced Eli and the old, washed up Eli can lose you games you should otherwise win. None of this is to say that Darnold shouldn’t be a top pick in the draft. Eli went No. 1 overall, and absolutely lived up to the billing. But proceed with caution before expecting Darnold to come out the gate and play like Andrew Luck. The USC kid has got talent and experience, but he may be a tad overrated. Wyoming’s signal caller has a cannon for an arm-but so did JaMarcus Russel. 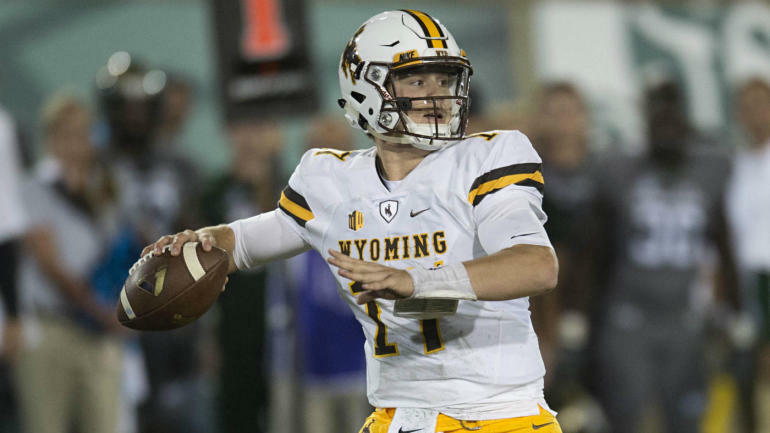 Josh Allen has gained momentum as the next small school quarterback to be drafted early after the rapid ascension of Carson Wentz from unheralded prospect to Number 2 pick and MVP candidate in just two seasons. Like Wentz, Allen fits the physical profile of a franchise QB a tall country boy with a rocket launcher attached to his right shoulder. But Allen comes with many of the same concerns Wentz did-and those concerns be warranted in Allen’s case. As a small school quarterback, it’s tough to gauge how Allen will perform against NFL caliber athletes. Although the Mountain West is an FBS division and a clear step up from Wentz’s North Dakota State schedule, it can be difficult to differentiate between carving up the University of New Mexico’s secondary and throwing darts through tight windows against NFL caliber talent. Watching Allen’s tape, his arm is uncanny. Every conversation begins around that arm strength-and it has to. Allen will sit in the pocket for a couple seconds, then meander outside of it to his right, with defenders closing in all the while. Then, a big shuffle step and Allen will uncork a throw with the flight pattern of a long fly ball, wobbling precipitously all the while. Miraculously, it’ll land in the hands of a jubilant wide receiver in the endzone, with the entirety of the state losing their collective minds as Allen grins like he knew it all along. And so NFL scouts see that arm, consider the possibilities with some NFL coaching, and envision the country boy flinging shots into places no one else can in a conference championship game. They see Wentz and Brett Favre, small school QB’s with big time arms. They see gunslingers like Carson Palmer and Matt Stafford leading long downtrodden squads to the promised land. But for every Wentz and Favre, there’s a Brandon Weeden and Jeff George. Arm strength is not everything in the NFL, and in his limited opportunities against Power 5 teams Allen has looked shaky and inconsistent against the ramped up pace of play. The combine and pre-draft process is crucial for Allen. That’s where Wentz separated himself from a big arm with no pedigree to a legitimate contender for the first overall selection. Allen is worth keeping an eye on-arms like that don’t grow on trees. But to draft him first overall, or even in the first round, would be a mistake based on the information currently available. Four signal callers are in contention to be first round selections. Josh Rosen, Josh Allen, Sam Darnold, and Baker Mayfield. Josh Rosen has been the star of the show since high school-the former five star recruit won the starting quarterback job as a true freshman at UCLA, and has consistently produced whenever healthy. Rosen’s signature moment was a thrilling comeback victory over Texas A&M early this season. 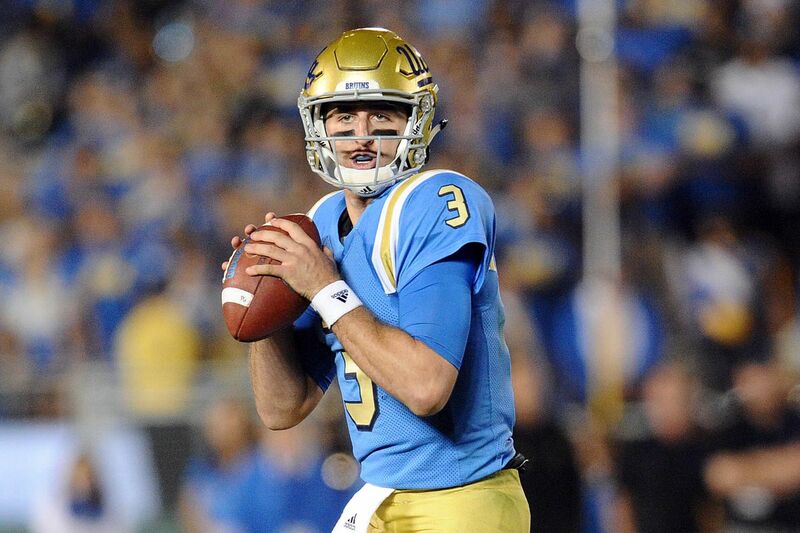 Trailing 44-10 late in the third quarter, Rosen and the Bruins offense posted an unanswered 28 on the scoreboard in the fourth to lead UCLA to an improbable win. Time after time he sat in the pocket and zipped big time throws with pinpoint accuracy into narrow windows in critical moments. The magnitude of the moment didn’t faze him. With seconds remaining, Jordan Lasley dropped an easy catch on third down that would have resulted in a first down. Rosen didn’t blink an eye and converted on 4th and 6 with a precise wheel route to his running back. Then, conjuring shades of the legendary Dan Marino, Rosen faked a spike and lofted a perfect ball to Lasley in the back corner of the endzone, which Lasley snatched over a TAMU defender to redeem himself and win the game. “The Rosen One” has got gumption, and the arm to match. He’s been the guy at every level since high school, and is sure to be in for a rude awakening of some sort in the NFL-all rookies are. Rosen is terrific as a pure thrower-the accuracy, arm strength, poise, and spin of his throws are on par with elite NFL quarterbacks. He has the height coaches require, standing at 6’3, and most importantly, has shown the ability to progress through his reads and make smart decisions with the football. The combination of arm and brain talent makes him a favorite to be the first overall pick in the draft in April. UCLA’s signal caller is not without his flaws, however. While tall, Rosen is slight of build relative to other top QB prospects, and his long term durability is in question. After an electrifying freshman year, Rosen was injured during a subpar sophomore campaign. Then, this season, despite being healthy and putting up numbers, Rosen led a Bruins team with college football playoff aspirations to a sub .500 record. Some pundits doubt his ability to carry his team, and worry that although he may possess the talent to be a franchise quarterback, his demeanor will hold him back. Rosen’s ideal comparison would be a fellow Californian who plays across town-LA Rams QB Jared Goff. Goff and Rosen have similar builds are faced questions about their ability to lead, given that their college teams often under-performed. Goff struggled mightily in his rookie campaign, hamstrung by Jeff Fisher’s decrepit offense and bizzare play calling. This season, with Sean McVay’s innovative offensive system installed, Goff has thrived and even garnered MVP consideration. The ball sure looks pretty coming out of Josh Rosen’s hand, and his motion and mechanics nearly mirror those of Goff, whose tall, slender frame and smooth motion makes for an easy comparison. The concerning comparison, given what some perceive to be an arrogant (which I would argue you almost need to be a successful NFL QB) and lackadaisical attitude from Rosen, would be Jay Cutler, a guy who has all the arm talent in the world but struggles to be anything more than a mediocre QB. Rosen’s proven in crunch time, and you can’t teach arm talent like that. It would be tough for anyone to thrive in Cleveland right now, but he might be the answer to the question of Eli Manning’s successor in New York. Bank on Rosen being gone in the first five picks of the draft. Josh Rosen can most definitely sling it. Up Next: Wyoming QB Josh Allen. October 11th, 2010. Atlanta, Georgia. Rick Ankiel on second, Tim Hudson on first, both by way of the walk. Hudson pinch running for Eric Hinske. San Francisco Giants closer Brian Wilson and his obsidian bird’s nest that some referred to as a beard on the mound. And for what could be the last time, Bobby Cox in the Braves dugout. Wilson was trying to preserve a masterful start by the Giants 20 year old rookie lefty Madison Bumgarner, one out away from the Giants first NLCS berth since 2002. In anti-climatic fashion, Melky Cabrera bounced a routine grounder to third. Uribe scoops it up, whips it across the diamond to first…got him! And while it was jubilation for the Giants in a magical year that would cumulate in a World Series victory, it was just business as usual for Atlanta in Bobby Cox’s last game ever. In Cox’s 20 years at the helm, the Braves won 14 straight division titles, went to five World Series, had three Hall of Fame pitchers in their prime, produced the best center fielder in the National League, and developed the greatest switch hitter of all time. And yet they won just a singular World Series. How, with all that talent, did they not create a dynasty that would be remembered forever? How is it that just twenty years later, the 1990’s Braves are mostly forgotten? This is the legend of baseball’s greatest dynasty that never was. Our story starts on June 23rd, 1990. As the world’s eyes were turned to the crumbling of the Soviet Union and the end of the Cold War, the heat was on in the muggy summer days in northern Georgia. General Manager Bobby Cox decided he had seen enough out of Manager Russ Nixon, and, failing to find a suitable replacement, appointed himself Manager of the laughingstock Atlanta Braves. The Braves hadn’t won a championship since Hank Aaron and the 1957 Milwaukee team beat the dynastic Mantle-Berra-Ford Yankees in the World Series, and the city of Atlanta had never experienced a championship at all. The Braves were not completely without hope, however. A young David Justice was in the midst of a Rookie of the Year campaign that would be indicative of the All-Star career he was soon to embark upon, and 25 year old centerfielder Ron Gant was coming into his own with a 30 homer/.300 average season while also swiping 30 bags. Earlier that month, the Braves had used the first overall pick in the draft to nab a hotshot young shortstop from Florida named Chipper Jones. Interestingly, the Braves were smitten with a high school right hander out of Texas with a big fastball and a bigger mouth named Todd Van Poppel, who told the Braves explicitly that he would not sign with them. The Braves then pivoted to select Jones. Van Poppel was drafted by the A’s with the 14th pick and had an ERA of 5.58 in the majors. While Jones provided a spark of hope for the future, the immediate outlook was gloomy mid-1990. Chipper was a high school draft pick and a few years away. Young ace John Smoltz had regressed from his breakout 1989, but still turned in a decent performance. Tom Glavine, having made tremendous strides the previous season, backslid dramatically in a worrying development. A freshly anointed non-teenage Steve Avery was pummeled in his initial go-around with big league hitters. Their “closer”, Joe Boever, saved a grand total of eight games. 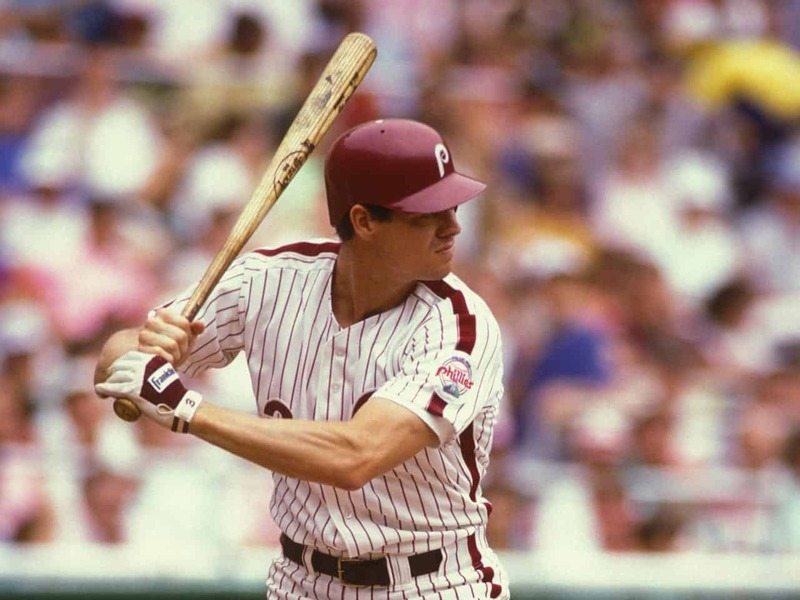 Atlanta legend Dale Murphy was washed up and traded mid-season to the Phillies, who took a flier to see if they could squeeze any last vestiges of talent from one of the NL’s premier sluggers in the 1980’s. Greg Olson hit .262 with seven homers and was somehow named an All-Star. Everyone else was either old (Charlie Leibrandt, Lonnie Smith) or not particularly good (Jim Presley, Pete Smith). As they stumbled to the finish line, optimistic fans clung to the notion that the young players would start to live up to their potential and the week-old-fish that was the 1990 Braves would improve to a mediocre 75 win squad that resembled stale bread, to stick with the food analogies. Instead, they got Cordon Bleu prepared filet mignon. The Braves skipped the step where they were supposed to improve year by year and instead careened past a caravan of NL teams jostling to unseat the World Series Champion Cincinnati Reds to find themselves in the World Series facing a Minnesota Twins squad that had done much of the same in the juinor circuit. Justice slid over to right field to replace Murphy, and turned in a solid, if unspectacular 21 homers and .275 average. Gant saw his average drop precipitously but slugged 32 more homers and was a terror on the basepaths once again. The real changes came from Jeff Treadway, who broke out to hit .320, and newcomers Terry Pendleton and Otis Nixon. Pendleton hit .319 and cracked 22 homers en route to the NL MVP award; a 32 year old Nixon swiped a double-take worthy seventy two stolen bases while batting nearly .300. They also featured a 23 year old left fielder who was speedy but struggled at the plate, though he would enjoy a nice season the following year. His name was Deion Sanders. On the mound, Glavine grasped the pinpoint control that would eventually land him in Cooperstown, winning the Cy Young Award while stifling hitters with a 2.55 ERA. A 34 year old Leibrandt showed he had something left in the tank, as he twirled 230 quality innings with an ERA of 3.49. Smoltz and Avery rounded out a lunch pail rotation where every starter pumped out over 210 innings. The Braves rode their four horsemen throughout the majority of the season, neglecting a traditional fifth starter. The bullpen, downright abysmal in 1990, improved to become one of the league’s better units in ’91. Nixon was suspended in mid-September for violating baseball’s drug policy, so they were forced to close out the stretch run without one of their primary weapons. They slid into the playoffs right ahead of the Los Angeles Dodgers and battled through Barry Bonds’ Pittsburgh Pirates in the NLCS to set the stage for a matchup with the Minnesota Twins. The Twins were a mirror image of the Braves, having also finished last in their league in 1990 and now found themselves four games away from being World Champions. After earning their keep in the sticky Georgia summer, the upstart Braves would cut their postseason teeth in frigid Minnesota, albeit in the enclosed Hubert H. Humphrey Metrodome. 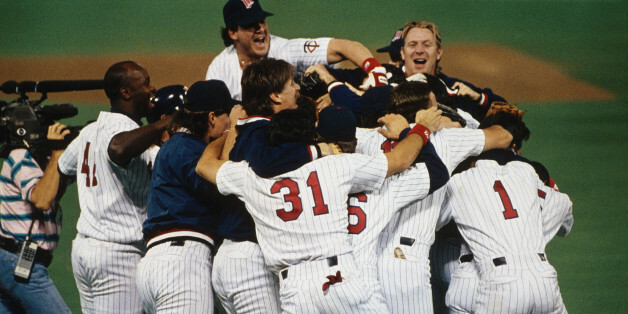 The 1991 World Series ended up being an All-Time classic. Veteran Jack Morris tossed seven solid innings in Game One for the Twins while fellow greybeard Leibrandt was roughed up in just four innings. Glavine went the distance in Game Two but was victimized by unearned runs, as well as the infamous Kent Hbrek play as the Braves found themselves in a 0-2 hole facing a critical Game Three. Down 0-2, the Braves turned to Avery for game three. Avery had been lights out all postseason and won the NLCS MVP that year. He didn’t disappoint, stifling the Twins all game long before being lifted for closer Alejandro Pena. Pena picked a terrible time to blow his first save with the Braves-slugger Chili Davis crushed a long home run to left as the first batter he faced. The two teams were then deadlocked until the twelfth, where David Justice began scripting his legend by singling and swiping a bag to put himself in scoring position. Mark Lemke poked a single to left and Justice slid in just ahead of the tag, and the Braves were breathing. If they had gone down 0-3, the series would have been all but over, but the emotional victory in Game 3 gave the Braves life to cling to. Game Four was tight as well. This time Lemke scored the winning run rather than having the winning RBI, scoring on a sac fly from Jerry Willard. Game 5 was a blowout, as Atlanta smacked the Twins 14-5, and were now just one game away from flipping the script from last place to World Champions. But the best laid plans of Mice and Men often go awry. Hall of Famer Kirby Puckett crushed a walk-off homer off of Leibrandt in the 11th in Game 6, deadlocking the series. Both teams found themselves right back where they started in Game 7, with Smoltz and Morris once again facing each other with the series even in the Metrodome. The 36 year old Morris, a Minnesota native, scattered 7 hits over 9 shutout innings. The one real scare came in the 8th, where Lonnie Smith singled and Pendleton doubled, giving the Braves two men in scoring position with no outs. But Morris worked his way through the heavy hitters-getting Gant to bounce out to first, and intentionally walking David Justice-before inducing a double play grounder from the light-hitting Sid Bream to snuff out the threat. Smoltz was lifted for Mike Stanton in the bottom of the 8th after the Twins threatened with runners at the corners and just one out. Stanton finagled his way through Puckett and Hbrek to keep the game scoreless. The game-and the series-was still undecided after 9 innings. Morris, in his 15th season, came out for the tenth and tossed a clean half inning without missing a beat. Cox sent Alejandro Pena out to the rubber to try to counter the indefatigable Morris. Pena, however, had left his mojo on the mound after two clean innings in Game 6. Dan Gladden doubled, Knoblauch bunted him over, Puckett and Hbrek were walked intentionally, and Gene Larkin launched a long fly ball out of reach for the drawn in outfield, scoring Gladden and winning one of the greatest series ever. Heartbreaking, to be sure. But the Braves would have considered a .500 season a success. Losing the World Series in such dramatic fashion stung, but the future was bright and the morale was high in the Peach State heading into the 1992 season. 1992 proved that the previous year wasn’t an abnormality. Smoltz, Glavine, and Avery all enjoyed brilliant seasons, and Charlie Leibrandt was solid again. Offensively, Gant and Justice struggled in ’92. Pendleton and Nixon were huge once again-Pendleton turned in a season nearly identical to his MVP campaign in the year prior, and Nixon hit .294 and stole 41 bases. The offense got a huge boost from none other than Deion Sanders, who ripped 14 triples, stole 26 bags, and hit .304 before he departed for NFL training camp in August. Despite the struggles of their two headline players and a bullpen that was nothing to write home about, the dominance of the three headed Smoltz-Glavine-Avery monster carried them to 98 wins and back to the Fall Classic. There, they faced a team north of the border, as the Toronto Blue Jays made their World Series debut. The Jays were led by a medley of youngsters and vets-their best players were 24 year old Roberto Alomar, 23 year old John Olereud, 32 year old Joe Carter, and 40 year old “Mr. May” Dave Winfield. Game one must have felt like a nightmarish version of Groundhog day for the Braves-the starter for Toronto was none other than Jack Morris himself. This time, the Braves were able to exorcise the demons as Glavine went the distance and steadied the team, while Morris struggled with control and took the loss. Though Smoltz pitched well in Game 2 matched up against Blue Jays ace David Cone, acquired from the Mets at the trade deadline, the bullpen couldn’t close the game out. Avery and Glavine each went 8 innings in Games 3 and 4, but the meager offense couldn’t muster much of anything against Jimmy Key or Juan Guzman. Ironically, Morris seemed to be the only pitcher they could figure out, as they roughed him up again in Game 5 to give themselves some semblance of hope, down 3-2. Steve Avery-still just 22 years old-got the start with their backs to the wall. He didn’t have it that day, unfortunately, lasting just four innings while Cone stymied the Atlanta offense once more. Down 2-1 in the bottom of the ninth, Otis Nixon singled home Jeff Blauser to send the game to extras and give them one last gasp. In a battle of veterans, Dave Winfield knocked in the winning run off Leibrandt, and a late rally in the bottom half of the inning fell just short for the Braves. Gant and Justice struggled mightily in the series, both hitting in the .100’s. Having lost back to back World Series, the pressure was now on with zero reservations. 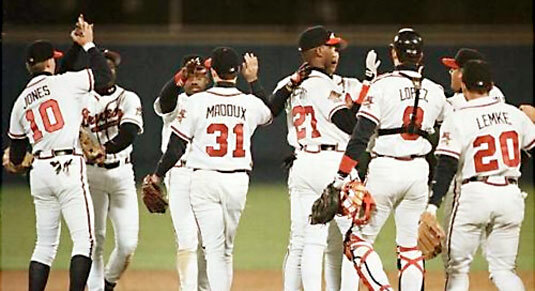 The 1993 Braves absolutely trounced the National League. Gant and Justice combined for 76 round-trippers, while Nixon continued to have success as a speed-reliant player at age 34. Midseason acquistion Fred McGriff was leaps and bounds better than Sid Bream at first. Javy Lopez and Ryan Klesko were even on that team, though they were minor players that season. Chipper Jones made his debut and got 2 hits in three at bats. Though the offense was improved, the franchise altering move made that off season was on the other side of the ball. Scott Boras felt that his client’s previous team, the Chicago Cubs, were lowballing his client. Frustrated with the direction of the negotiations, Boras pulled his client out and the Cubs ceased pursuing one of the greatest homegrown players they had ever produced. And that’s how the best rotation in baseball ended up adding Greg Maddux, forming an unstoppable foursome that absolutely dominated the NL. The only cloud on an otherwise clear horizon was that Avery, in the midst of a brilliant year, suffered a strange arm injury in early September. Though he would return that season, he was never the same pitcher afterwards. After looking like a future ace, Avery was simply a mediocre pitcher over the remainder of his career. The 1993 season, sadly, at age 23, ended up being the peak of his career. The ’93 Braves cruised through the regular season but were stopped cold by the Phillies in the NLCS. Led by a cadre of high average hitters, a juiced-up Lenny “Nails” Dykstra playing with the energy and reckless abandon that only he could, and a young Curt Schilling, the Phillies shocked the world and took the series, four games to two. This was now a trend that couldn’t be ignored. Why couldn’t the Braves succeed in the postseason? Why did they bow out every year? Either the pitchers couldn’t hit the broad side of a barn or the hitters looked like they were swinging balsa wood. Dominant regular season players stumbled. Justice and Gant again disappeared in big moments, while McGriff, Pendleton, and Nixon vailantly tried to make up for the sluggers’ simultaneous vanishing act. 1994 offered no solutions. There was no World Series to be played because of a strike, but the Braves’ season was enough of a disaster as it was. Though the team wasn’t terrible, finishing second in the NL East behind a dominant Expos squad, who might still be around today if that season gets finished, injuries and poor performances ran rampant throughout the team. Star outfielder Ron Gant signed a huge contract, broke his leg in an ATV accident, was cut, and did not play at all in 1994. His paltry 1993 NLCS performance ended up being his last at bats in a Braves uniform. Otis Nixon signed with the Red Sox. Chipper Jones was denied his much anticipated rookie season when he suffered a torn ACL in spring training, casting doubt on his career future. Smoltz, Glavine, and Avery all backslid significantly to grade out as league average pitchers, rather than the co-aces they had become over the previous three years. There were a few bright spots: Maddux enjoyed a tremendous season, twirling a sterling 1.56 ERA. Ryan Klesko and Javy Lopez both had encouraging rookie seasons, and Fred McGriff played at an MVP level. 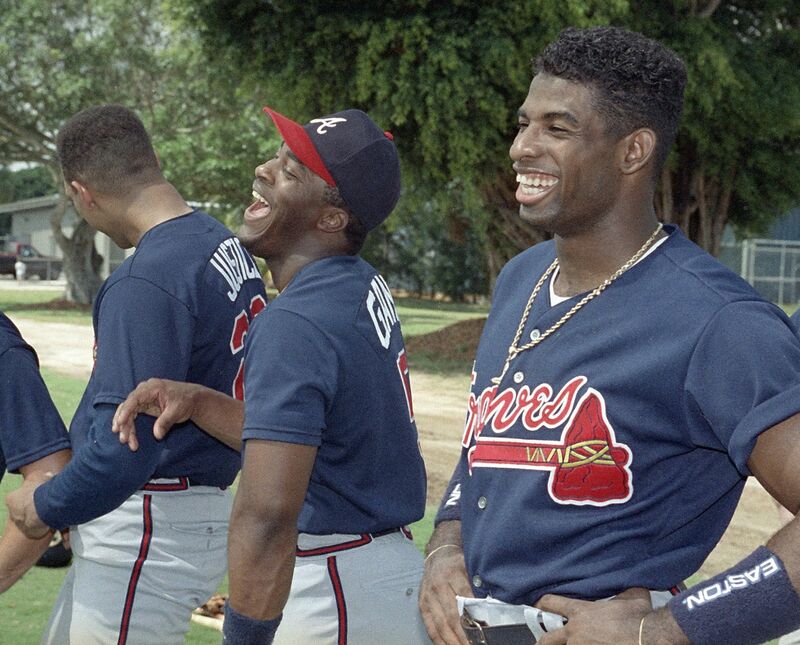 The overall disappointment of 1994 for all of baseball overshadowed the Braves’ struggles. However, there was no more hiding-1995 was the make it or break it season for this core. This team was simply too talented to continue to get bounced early. One could argue they ran into some bad luck-the Hbrek play, the rally falling just short in ’92, but the bottom line was they were not getting it done in October, which is when the great ones are defined. As the Braves were falling short every year in the MLB, the Buffalo Bills of the NFL in the early 1990’s went to four straight Super Bowls-an incredible accomplishment. More shocking, however, was that they managed to lose every single time. The parallels were striking-and concerning. Buzz was spreading that this team was too mentally weak to finish the job. Coming in to ’95, GM John Schuerholz engineered a trade for Marquis Grissom, a speedy centerfielder who brought stellar defense and pop in his bat to the top of the lineup. Just 28, Grissom was in the midst of his prime. Chipper Jones made his eagerly awaited debut and was a success, swatting 23 homers while batting a respectable .267. Klesko and Lopez were brilliant, easing the transition away from Gant and Pendleton. And while Avery struggled like an aging vet, despite being only 25, Maddux and Glavine were masterful control artists, and the flamethrowing Smoltz was dominant as well. The once melodramatic bullpen-long an Achilles heel of this team-was finally solid, with Mark Wohlers and his mullet serving as steady closer. The Braves steamrolled their way through a Rockies team that had made the playoffs in just their third year of existence and a slugging Reds team led by Barry Larkin, Reggie Sanders, and none other than Ron Gant to reach their third World Series of the decade. The ’95 Series was set up to be a classic. The Braves, always the bridesmaid and never the bride, were led by one of the greatest pitching staffs ever assembled and had their fingers crossed that the third time would be the charm in their elusive quest for a championship. The Cleveland Indians, their AL counterparts, were polar opposites. The Indians had enough pitching to get by, led by a 41 year old Dennis Martinez, who had earned an All-Star berth in his 20th season, and a quality bullpen, but the breadwinner of this team was their historic offense. It wasn’t one of those much acclaimed “cerebral baseball” offenses built on timely hitting and sabermetrics-oh no, this offense was about as in-your-face 1990’s home run culture baseball as it gets. Dingers, dingers, and more dingers. Jacobs Field was a veritable launching pad in 1995. Paul Sorrento, Jim Thome, Manny Ramirez, and Albert Belle all smoked at least 25 homers en route to the team hitting 207 overall. Belle cracked an even 50 and a 39 year old Eddie Murray belted 21 more while hitting .323. Omar Vizquel and Kenny Lofton provided speed and brilliant defense to complement the barrage of long balls for the 100 win team. Initially, it looked as if this matchup of historic pitching versus historic offense was going to lean Atlanta’s way. Maddux and Glavine were the perfect foils to the free swinging Indians, mixing speeds and utilizing pinpoint command to neutralize the Cleveland’s big bats. As the old adage goes, “The art of hitting is timing. The art of pitching is disupting that timing.” Maddux and Glavine were uniquely situated as soft tossers to shut down an offense built on healthy cuts at triple digit fastballs, staking the Braves to a 2-0 lead with back to back brilliant performances. Smoltz, however, was exactly the type of power pitcher the Indians had feasted on all year, and he was lifted after just 2 1/3rd innings of work in Game 3. The Braves turned to Avery in Game 4, whose ineffective season when he should have been entering his prime was one of the saddest stories of an otherwise positive season. Avery dug deep and rose the occasion, allowing just one run in 6 solid innings in a crucial start. The Braves needed Game 4 to stifle any momentum building in the Indians clubhouse, and he shut them down at Jacobs Field in Cleveland. They were oh-so-close in Game 5 to sealing the deal. Maddux wasn’t as sharp as usual, and the Atlanta offense wasn’t able to muster much of anything against Orel Hershiser. Down 4-2 in the eighth, Cox replaced Maddux with Brad Clontz, who gave up what appeared to be an inconsequential homer to Thome. It ended up being costly, as Klesko hit a two run bomb in the top of the ninth to pull them within a run. However, Jose Mesa was able to get Lemke looking to end the threat and pull within a game of the Braves. Game 6 was at home for the Braves, and the World Series victory that had eluded them for so long was within reach. Glavine got the nod for Atlanta, opposite Indians ace Dennis Martinez. Martinez had managed to evade the clutches of Father Time to that point, having dished 187 innings with a 3.08 ERA in his 20th season, but he faltered in Game 6, walking 5 hitters before bowing out in the 5th. Despite issuing five free passes and surrendering 4 hits, the Braves were unable to translate those opportunities into runs, and the game was scoreless through 5. Meanwhile, Glavine had his best stuff and was working on a no-hitter while his offense squandered multiple opportunities to give him any run support. Backup catcher Tony Pena blooped a soft liner just out of reach of Lemke to shallow right center to lead off the 6th, ending Glavine’s no hit bid. Glavine didn’t blink, retiring three straight hitters to close out the inning. In the bottom of the 6th, David Justice was set to lead off against Jim Poole. Justice had enjoyed his share of October magic moments early in his career, but his recent postseason performance had been much maligned, and rightfully so. Justice, arguably the heart and soul of this team since their first postseason foray in 1991, stepped up to the plate and socked a 1-1 pitch over the right field fence, igniting a stadium that had been waiting all night for something to cheer about and firmly cementing David Justice’s legacy as an All-Time great Atlanta Brave. Tom Glavine grabbed the lead he had been given and put it in a stranglehold. After a half decade of heartbreak, no one could touch him on that day. 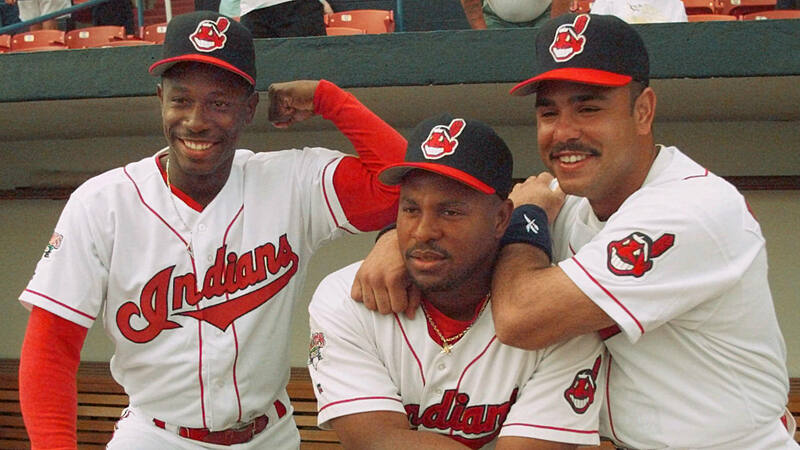 Belle, Ramirez, and Thome, who combined to hit 1,548 homers over their careers, were vanquished time and time again. He finally yielded to Mark Wohlers for the ninth, having given up just one hit while walking three and striking out eight over eight immaculate innings. Wohlers, and his mullet, had been a godsend for a team who had a history of bullpens that crumpled under pressure in the postseason. He got Kenny Lofton to pop out and then got Paul Sorrento to fly out to center. Carlos Baerga put a good swing on an 0-1 pitch, but it didn’t have any legs to it, and Grissom was under it. Finally, the Braves had done it! The monkey was officially off their back as the years of heartbreak, near misses, and frustration were washed away with the jubilation of a World Series victory. Glavine was deservedly the MVP. This is where the story would end for many teams. Forged by the trials and tribulations of early failures, the satisfaction of a championship would signify overall success after years of front office maneuvering, early days for the players, and long nights for the coaches. 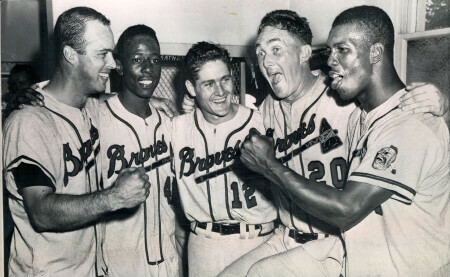 However, these Braves were a different breed. Their ascension had been so rapid, and their presence so consistent, that it was easily forgotten how young they all were. 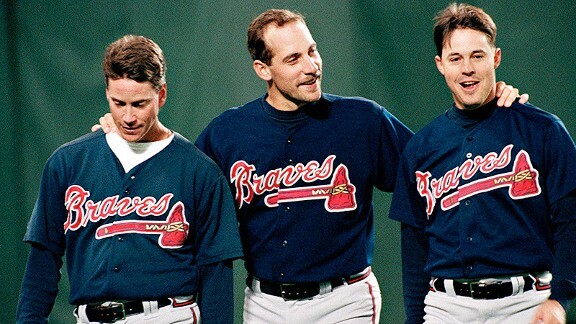 Maddux, Smoltz, and Glavine were all in the middle of their prime entering 1996, having mastering the intricacies of pitching without getting so old that their physical abilities were eroding. Ryan Klesko, Javy Lopez, and Chipper had already established themselves as All-Star caliber players before the age of 25. McGriff was the oldest starter at 32, and showed no signs of that he was fading, have a resurgence of sorts after a relatively down year in 1995. Wohlers, too, who had been so calm and collected in securing the Series in ’95, was still just a kid-he was just 26 in 1996. With the pressure of the first one out of the way, this team still had major dynasty potential. And that’s what made that team so unique. They were so good for so long, but they only managed to break through just once. A couple different bounces, the Kent Hbrek play, Avery’s injury and subsequent struggles, or any number of minute details that swung one way could have altered the course of baseball history forever. The Braves made it back to the series in 1996, behind strong offensive performances from Klesko, Chipper, Javy Lopez, and a career year for Grissom. Justice separated his shoulder in May and was lost for the year. His replacement acquitted himself well in limited action-a 22 year old Jermaine Dye got his start with the 1990’s Braves. It was business as usual for Maddux, Smoltz, and Glavine-excellency so consistent it was almost boring. Avery was simply an average pitcher at this point, a disappointing story of a young ace never living up to his potential. Their fifth starter was none other than Jason Schmidt, who occasionally gobbled up innings in meaningless games. Though his performance left much to be desired, he eventually became an All-Star years later. Towards the end of the season, the Braves called up a skinny teenager with gobs of talent for a quick cameo. He would patrol centerfield as one of the best players in baseball for the next decade-Andruw Jones. There, they would encounter a young Yankees team seeking to create their own identity after the retirement of Don Mattingly. After teeing off on Andy Pettite in Game 1 and posting another shutout victory in Game 2, Atlanta was in the driver’s seat to become back to back champions, mirroring the Blue Jays who had done it just three years prior. But the wheels fell off as they lost four straight, including the last three by a hair’s breadth. Maddux was outdueled by old nemesis Jimmy Key and the Yankees bullpen in Game 6. The Braves were officially choke artists, and Schuerholz knew drastic changes needed to be made. They let Avery walk in Free Agency, as their young ace had lost something when he was injured on that September day in 1993, and he never found it again. Then, shockingly, Schuerholz dealt Justice, a Braves legend, and Marquis Grissom, for Kenny Lofton and Alan Embree. Jermaine Dye, who had impressed in his debut as a replacement for Justice while he was on the DL, was flipped to Kansas City as part of a package for Michael Tucker. And yet the Braves were good again 1997, winning over 100 games. It’s hard to be bad when three of the top five pitchers in the league are in your rotation. A 20 year old Jones impressed with his power and defense in a part time role. It wasn’t enough to get back to the Fall Classic, as they were unseated as the NL representative in the World Series by a young and inspired Florida Marlins team. After 1997, McGriff, Lemke, and Blauser-three quarters of the infield-were gone. McGriff, a high profile acquisition who had delivered on all promises in Atlanta, was replaced by home run king Andres Galarraga. Neither Mark Lemke or Jeff Blauser had been the face of the franchise during their tenure as the traditional light-hitting, slick-fielding, middle infield duo. But they had both been there since the dark years, outlasting big names like Gant, Justice, Pendleton, and Avery as the model of consistency for the well oiled machine that was the 1990’s Braves. And while perhaps overlooked in context with the stars they were surrounded by, both were crucial to the Braves’ success. Lemke had his walkoff single way back in ’91, and Blauser made a couple All-Star teams during his tenure. They were denied a chance to get revenge on the Yankees in ’98, losing to the Padres in the NLCS, though the Jones’s were starting to gain notoriety as legitimate MVP candidates around the league. Glavine won the Cy Young Award for a second time. They would get one last shot in 1999, as their sweet swinging third basemen would win the MVP award and lead them back to the promised land. If the Braves won in 1999, they would have tied the Yankees and Jays with two wins a piece, and with the number of appearances they made, could have staked their claim as the team of the decade. Instead, they got swept, and the Yankees established themselves as the team of the decade, despite spending the first few years of the ’90’s as an afterthought. Jeter, Petitte, and Bernie Wiliams got more of the national spotlight than Chipper, Glavine, and David Justice. The Braves didn’t just go quietly into the night. A team with that much talent is always going to be competitive. Cox won 14 straight divison titles on the backs of Chipper Jones, Andruw Jones, Javy Lopez, and John Smoltz. Smoltz-the original ace, and loyal son-blew out his elbow in 2000 and required Tommy John surgery. He came back to be one of the best closers in the baseball for four years, before switching back into the rotation and dominating late into his 30s. Glavine left for the rival New York Mets in free agency in 2002, finding success for many more years with his unique ability to place the ball wherever he wanted. Maddux, too, departed after the 2003 season, returning to his original team in the Chicago Cubs. Andruw Jones became an all time great centerfielder and menace at the plate, and looked to be a lock for the Hall, before leaving for the Dodgers in free agency in 2008. Age and lack of conditioning caught up to him quickly, and his career fell off a cliff once he left Atlanta, putting his candidacy in serious doubt. David Justice spent a few more good years with the Indians and the Yankees, before closing out his career with the Moneyball A’s. Ron Gant recovered well from his ATV accident, and finished his career with 321 homers. Fred McGriff’s Hall of Fame snub hasn’t been discussed enough-he went on to play quality baseball for another half decade, and hitting a clean 493 homers in the midst of the steroid era is no easy feat. Chipper crushed NL pitching from both sides of the dish for another 12 years, before retiring in 2012 as a surefire Hall of Fame candidate. It was probably for the best that Todd Van Poppel told the Braves front office to get lost 22 years earlier. And so those ’90’s braves leave a complicated legacy. The strongest iterations of that dynasty could make an argument to be among the greatest teams of all time. The rotation of Maddux, Smoltz, Glavine, and Avery in mid 1993, when they were all still young and healthy, was arguably the best collection of pitching talent ever assembled on one team. Their ability to replace star players without missing a beat was uncanny-Chipper replacing Pendleton, Grissom and then Andruw Jones supplanting Ron Gant, Ryan Klesko and Javy Lopez developing into stars to replace the offense of David Justice, and even turning the best cornerback in the NFL into an All-Star caliber leadoff hitter. The Braves were a model of how to sustainbly run an organization. They drafted well to give their team depth, and cultivated a culture of success that attracted star free agents and allowed them to resign the players they had developed into stars. Yet despite doing everything right, time and time again they appeared to be snakebitten in the game’s biggest moments, consistently under performing the sum of their parts or encountering tough luck at the most inopportune times. How should we remember the 1990’s Braves? Were they an all time great team with rotten luck? Or were they pretenders who couldn’t handle the heat being turned up in October? That one championship saved them from being the infamous 1990’s Braves, in the same manner of those Buffalo Bills. But strangely, instead of staking their claim as an All-Time great dynasty, or gaining notoriety for their October failures, the ’90’s Braves are almost…forgotten. Which is a real shame. Again, Bobby Cox managed to win fourteen straight division titles. They went to an incredible five World Series in a decade that only had nine (remember the ’94 strike). None of the teams that followed them as flag bearers of the National League had the staying power they did. First it was Randy Johnson and Curt Schiling’s Diamondbacks, then Barry Bonds and the Giants, another young Marlins team, the Pujols Cardinals, Triple B’s in Houston, an upstart Rockies team, and then the Phillies-none of them had the consistency of the Braves. None of them dominated the NL the way the Braves did for a decade. And though the Braves had their iron grip on the National League wrestled out of their grasp in this millennium, they continued to be a consistent presence in the playoffs, as evidenced by Bobby Cox’s playoff streak, always searching for something to match the hardware from 1995. And while some may call them disappointing, the iconic moments, the surgical precison, the raw emotion, and the unchecked joy they gave to the people of Georgia for the better part of a decade…should be considered nothing short of legendary. The Ohio State Buckeyes (AP #11) were in the pole position to sew up one of the final spots of the playoff after a thrilling comeback win over Penn State. As the premier team in Ohio State could afford a loss to Iowa in a tough road environment. What they couldn’t afford was an absolute shellacking combined with a Penn State collapse taking the sheen off their signature win. The image of a calm and composed Nate Stanley rifling a touchdown pass to the back right corner of the end zone with a 265 pound defensive lineman draped all over his leg will live on in fame for Iowa fans and in infamy for Buckeye fans. It’s curtains for the Bucks with two losses. Washington’s loss to Arizona State, coupled with the limited media exposure that comes with being a small market team, may doom the Huskies to falling just outside the final four. It’s going to take them ripping off several consecutive impressive victories, plus a serious stumble by Notre Dame or Clemson, to get their foot in the door. They no longer control their own fate. The ramifications are major in this weeks slate of games. It’s the best time of the year.